Our favorite fall cookie! Bake up a batch of these soft, buttery ginger cookies with molasses and fall spices. All you need are basic ingredients and the self control to not eat them all! Give me a plate of soft sugar cookies, a hot mug of chai tea and a Snuggie, and I can pretty accurately describe my ideal fall day to you. Make it ginger cookies and you’ve sent me straight to heaven! Soft, buttery ginger cookies with a kick of molasses and all the best fall spices are my favorite two-bite treat this time of year. Too bad they’re so easy to make… then I’d have a better excuse to stop making them! My cookie lovin’ friends aren’t complaining, though. I snatched up this scrumptious cookie recipe from AllRecipes, and I won’t deny it because 1) I’m not nearly a good enough baker to just make this stuff up, and 2) the reviews were amazing enough to send me tearing through my cabinets the same minute I found it! These spiced, soft cookies did not disappoint and honestly, I’ve never seen a dessert disappear faster from my kitchen. Who am I kidding, these were breakfast some days too! Whether as a tasty treat to get you in the fall mood, or as a simple dessert for the Thanksgiving table, a stack of warm, freshly baked ginger cookies will hit the spot. Bust out the basic ingredients and get baking – you’re going to love these! In a medium bowl, sift together flour, baking soda, salt, ginger, cinnamon and cloves. Set aside. In a large bowl, cream together butter and 1 cup sugar until light and fluffy. Beat in egg, water and molasses. Gradually stir the dry mixture into the wet mixture. Shape dough into walnut sized balls, and roll them in the remaining 1/3 cup of sugar. Place the cookies 2 inches apart on an ungreased cookie sheet, flattening slightly with the bottom of a measuring cup. Bake 8 to 10 minutes in the preheated oven. Allow cookies to cool on baking sheet for 5 minutes before removing to a wire rack to cool completely. Store in an airtight container for up to 5 days. I love soft ginger cookies & these look just perfectly delicious. This recipe is so good! I just adapted it recently too! Mine turned out a lot darker than yours though. I love soft ginger cookies and these look incredible! I love ginger in cookies. But I am a soft cookie girl, so ginger snaps just don’t do it for me. But these, these look perfect! I love the flavor of ginger cookies but I always prefer a soft cookie to a crunchy one. These look like they would be perfect for me! I’m not a big fan of ginger, but I love cookies that include it! These look wonderful – very similar to one of the cookies I received last year as part of the Great Food Blogger Cookie Swap. I loooved those + bet i’ll love these when i make ’em, too! Much like you I could have cookies, coffee or tea and warm blanket with some cookbook in my hand and I am pretty set through whole winter! hehe Your cookies looks fantastic, I love your tempting pictures! Well done, Georgia! I could totally get on board with these cookies, a snuggie, and cold glass of milk! I prefer soft cookies, and ginger sounds great for cookies! These are so pretty, and I bet they taste amazing too! These scream Christmas to me. I love simple cookies the best. Shortbread, sugar, snickerdoodles, etc. These fit right in my category. Must try! 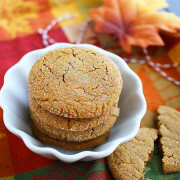 Ginger cookies are such a great way to incorporate the fall flavors. They sort of remind me of biscoff, although that is more gingerbread, but still. Wow!! Cookies is one of my favorite ever!! if you want me to pick one option (Love Or Cookie) then I’ll definitely choose the second one for sure. I love soft ginger cookies… these look perfect! I love ginger anything and these cookies look to die for! I love a soft cookie, these look delish! I’m on a bit of a ginger cookie craze right now and these look just scrumptious. I will bookmark to try on the weekend. I am very familiar with the AllRecipes gem! IT is indeed the perfect soft ginger cookie! I am planning on making it again this year with some candied ginger bits tossed in. Your pictures look amazing of these. Can I have one right now? Your photos are gorgeous and make my mouth water! Never made ginger cookies but have always wanted to!! These are just perfect for the season…love the flavors! I made these yesterday and they were awesome! They almost taste like an oatmeal cream pie in a cookie. I’ll definitely make these again. Thanks for the recipe. If you store these cookies with a slice of bread they will stay soft longer.